Floating and swimming over the water they look so graceful. Standing around on the sand banks they get into some most unusual poses. 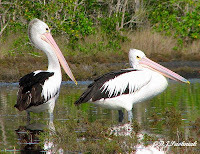 Their beaks look enormous however they are holding them. They give a harsh grunt when they don't want to be disturbed – and the eyes look positively evil. 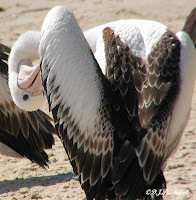 Even a pelican's neck needs scratching sometimes. 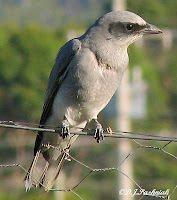 A juvenile bird grooming its feathers. 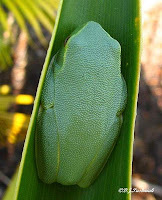 I found this little frog early this morning on the leaf of a Gymea Lily. Up here we are overrun with cane toads so frogs in my garden are unusual and special. I took photos and came inside and looked up the Frogs Australia site which I had read about on Esperance Fauna blog site. Then I went outside again and gently touched the little frog with a piece of grass so I could see a bit more of it. I think it is possibly an Orange Eyed Tree Frog (Litoria chloris) but would be happy to have this checked. I know very little about frogs but just wish there were more of them in the garden. 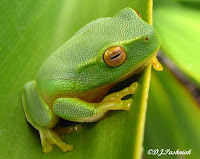 I've just had a conversation with a local frog expert and he agrees with Snail's ID that the frog is Litoria gracilenta (Graceful Tree Frog or Dainty Green Tree Frog) - not the one I had thought. Apparently Litoria gracilenta does not always have the blue color on its legs but the texture of the skin makes the ID definite. One of the things I find most frustrating about birding in my backyard is the number of birds that come down briefly into my yard and fly off again very quickly. They just don't like the area! That's understandable of course as in the process of turning this into land suitable for housing all the large trees and shrubs have been taken out. Since coming here I have planted things as quickly as possible but none of the trees are very large yet. Last year I had brief views of Black-faced Cuckoo-shrikes but none stayed long enough for me to even get the camera out. This year they have been back briefly and I was able to at least get a few photos. I hear them fairly often but I think they are possibly over the road from here in an area of National Park. In May I got photos of this bird – an immature bird. In late June this one came and sat on the electricity wires on the roadside and looked things over for a while. A couple of months later again and quite a group of birds were next door in the big pine tree. I was very interested to see the way the birds were moving their wings as they sat and called to each other. I have been told by an experienced birder that they used to be called “Shufflewings” for this display. I have now also found this name listed in the Readers' Digest Book of Australian Birds. This little video clip shows this action but was taken handheld and is a bit shaky! The other day I kayaked down the bay to see if the Osprey nest was being used this year. This nest is in a different place from the one I wrote about the other week. There was an Osprey sitting on a branch close to the nest but instead of taking a distant photo I decided to get out on the bank and get closer. However, by the time I got there the bird had flown off. I took a photo of the nest just for a record and when I examined it at home I saw the other bird's head sticking up from the nest. I was disappointed I had not got photos of the bird on the branch, but yesterday certainly made up for it! 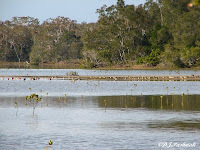 Yesterday I was down on the Noosa river for the monthly bird survey. As we were boating along the side of the river we spotted this bird sitting in a tree overlooking the water. The bird was not at all disturbed by the boat edging closer right underneath where it was sitting and I got closer to an Osprey than I have ever been! It felt secure enough to even preen a little for us! Early morning on the bay is a particularly beautiful time of the day. As the sun comes up everything is tinted silver. 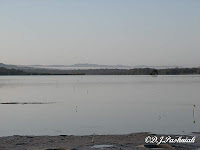 With the tide half out and the sand flats exposed every little puddle becomes a silver mirror. This is how the bay looked the other morning. 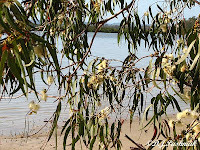 This gum tree was hanging down over the sand. It's roots had been partly loosened by storms this last winter which cut soil away from the shoreline. As I watched a group of little birds flew hurriedly out from among the flowers. They sat on another tree a few metres away and chattered noisily for a few minutes then flew back in among the flowers. Then again they all flew quickly off. This time I saw that there was something bigger in the tree which was scaring the smaller birds. 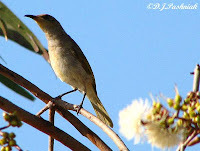 I watched and finally saw that a couple of Noisy Friarbirds were also enjoying the flowers but when the little birds – Brown Honeyeaters – came too close they were chasing them off. I had not seen Noisy Friarbirds do this before, but in my garden they are better matched for size and apparently aggression with the Blue-faced Honeyeaters and Rainbow Lorikeets. I found it a daunting experience when I was first confronted with a flock of several thousand terns. Nearly three years later and it is even more frustrating since I am now aware of how much I still don't know! I am learning! But I wish it could be faster! I am greatly indebted to Jill Dening from the Sunshine Coast. 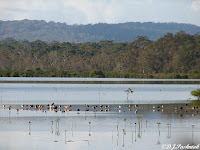 First she let me join her group which was surveying all shorebirds and seabirds on the Noosa River sandbanks. Then she is a great teacher and extremely patient with questions which have to be asked and answered a number of times. The other members of the group, who are all more experienced than I am, have also been a great help. This post is just about Crested Terns. It is an attempt to give some idea of the sequence of moult throughout the year. I will not include photos from every month but enough to show the changes in plumage throughout the year. January: the first bird is in breeding plumage. The next is a juvenile which appears to have been born very late in the previous season. February: An adult still in breeding plumage with a juvenile and next a juvenile and an adult going out of breeding plumage. April: A juvenile begging for food from an adult. There are always a few juveniles that continue to beg from an adult (presumably a parent) long after they have come here from the islands where they are born. They are well able to look after themselves and Jill says that she has never seen one actually being fed. June: First an adult well into non-breeding plumage and next two juveniles from the last breeding season. August: An adult about to go into breeding plumage. October: Adults in breeding plumage. 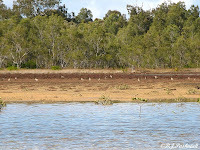 The second photo shows the birds strutting around and displaying their plumage. November: An adult on the left but not in breeding plumage and a juvenile from the previous season. Down the 'pathways of the sky' from Alaska to Inskip Point. 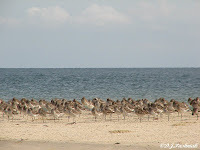 A newly arrived flock of Bar-tailed Godwits rest on a sandbank at high tide. This is a great time of year. The migratory shorebirds are all returning. I know that I posted about the first ones I saw about a week ago but it seems to me that listing the new birds I see is not enough to celebrate their accomplishment. Each year this bird marathon takes place. They start off from different places in different countries and join in a flight down here to Australia. So here's to you bird athletes! I applaud your abilities and your accomplishments! 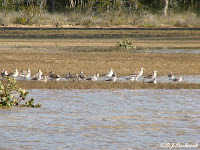 All winter long the bays and sand banks have been empty but now there are scattered groups and long lines of birds standing together at high tide. 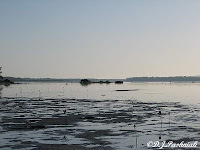 Some are so hungry that they continue to hunt for food on the edge of the salt marsh as the tide comes in. Some stand at the edge of the bay, and some stand right out in the water and must retreat with the rising tide. All are a little restless as if they can't quite take in that this is journey's end and they are safe. Later on I will be able to approach quite closely without them doing more than blink a sleepy eye at me but for now I will stay well back and let them learn to relax in the safety of this bay. All the birds are champions, but for me some merit special attention for their accomplishments. I always look first for the Bar-tailed Godwits. Maybe this is because my father showed me these birds when I was very young. Even he, however, could not have realized how remarkable their migration really was since it was only last year that satelite tracking proved their non-stop flight of approximately 12,000 kms from Alaska to eastern Australia or New Zealand. The largest – the Eastern Curlew are hard to miss especially since their cries alert all the other birds to the presence of the bird watcher. The small ones such as the Lesser Sand Plover, and the Red-necked Stint settle down among the salt marsh plants and make it very hard to get good photos of them. However, this is becoming a list again so I shall just say: Welcome back shorebirds! You give me pleasure just by being here.